Farquhar Macrae of Inverinate, who was suspected as a young man of having strong Jacobite sympathies, nevertheless avoided any serious consequences after the defeat of the Jacobite forces at Culloden in 1746. He married twice, first in 1755, and died in Kintail in 1789. His twelve children were all from his first marriage and three of his sons went to Demerara. His eldest son Alexander Macrae was born 10 May, 1756. The first record of him in Demerara is in the Essequebo en Demerarische Courant of 1793-94, when his partnership with John Sutherland was dissolved. By 1798 he owned plantation New Hope, a sugar estate on the east bank of the Demerara River. Inverness Courier 1812 August 28—"Died, on the 8th June last, at his estate in Demerara, Alexander Macrae, Esq., a member of the Court of Policy of that Colony, and chief of the respectable and ancient family of his name in the Highlands of Scotland." Another son, Farquhar Macrae, was born 30 March, 1764. He trained as a doctor and served with Lord Macartney's embassy to China in 1792-94. He died in Demerara in 1806, in a duel with a Major Blair. 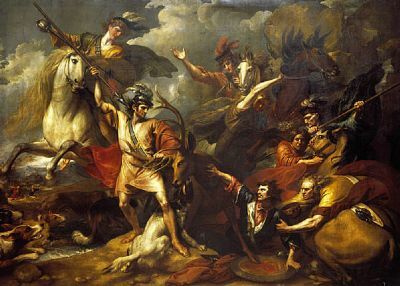 Farquhar is said to have been the model for the figure of Colin Fitzgerald (holding the spear) in Benjamin West's 'Alexander III saved from the fury of a stag'. The youngest son, Colin Macrae, was born in 1776. For further detail go to Colin Macrae. Four nephews of these three brothers also came to Demerara. Their brother Duncan's three sons - Kenneth, Alexander and Duncan - were all plantation owners. Alexander published 'A Manual of Plantership' in 1856 and invented a steam-powered plough. He returned to Britain, but died on the voyage to Southampton in 1861. Their sister Jean's sons, Donald and Archibald Macqueen, were also in Demerara.